We were clearly inspired by the “Cow Parade”. 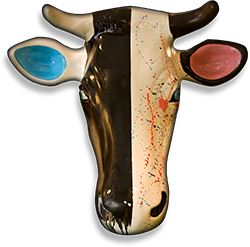 We love the creative side of the cows and they are a great media asset. Having contacted the “Cow Parade” people in the US and confronted with the complexity of the whole business we decided to round up our own French cows. We contacted JonOne, an artist we first met in 1992 and who did some great work in our first 2 hotels. Considering his ever growing reputation and busy schedule, a measure of his immense talent, we were ecstatic when he agreed to throw himself into “Mission Cow” as he put it. Jon herded three of his friends into the project, each one creating a cow in his own unique style, enriching the project with their very individual bovine visions!